About a week ago, I happened to have one of those rare days where I was completely alone at home. I spent a few hours working on some school stuff before I realized that I had a lot of time left on my hands. Why not get some writing done? Now typically when I say that to myself, I open up the document, remember how much I hate the spot where I left off, and close my computer again. It's very, very unproductive and it's why I've been in such an annoying slump with writing lately. But this time, that wasn't the case! I wrote an entire chapter in just a few short hours, created a brand new updated outline, and even started figuring out the following chapter. That was the most I had done to my book in weeks. And then the next day, I finished the next chapter. And then the next day, I got halfway through the next! So what happened? What gave me all of this sudden motivation? When I was first writing Unperfected, I had a playlist of songs I would listen to on repeat. Sometimes I would listen to scores from movie soundtracks, rain or nature sounds, or even static. Over time, I now realize, I stopped doing that. I found other tricks to help me stay focused, or the times I sat down to write were times where I didn't have access to music or internet. Well, this time I went on YouTube to see if I could find any playlists that would help me focus on the scene I was working on. My characters were in the middle of an argument, so I wanted to listen to something that would help me get into an angry/frustrated mood. I realized very quickly that I had a few private playlists on YouTube for writing that I had completely forgotten about. And almost as soon as I started listening to them, I was hit with this old feeling of motivation and excitement. I could picture scenes in my head, and I knew exactly what I wanted my characters to say. The music had a way of working with my mind and piecing lines of dialogue together. On top of the change in music, I switched up my position and location. Usually I write upstairs in my room, but for a while I would do a lot of my writing at the kitchen table downstairs. I decided to try that again, and it seriously helped! I still can't believe how much motivation I've had lately, all from simply going back and reusing some old writing methods. So that's my little piece of writing advice for the day. 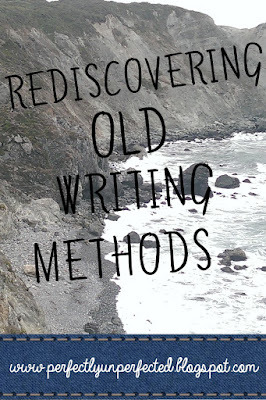 If you're stuck, try rediscovering some old writing methods! Write in a notebook like you did when you were younger. Write in a different room. Write outside. Write inside. Listen to old playlists or songs that would help you focus. Whatever you used to do, do it again. You might be surprised at the results! You don't know how much this helped me. I've had the exact same feeling for two weeks now, where I hate the scene I stopped at so I didn't write. It's so encouraging to find out that someone else was going through the same thing! Thank you!!! Its getting scary how perfectly timed your posts are, and they're always about what I'm struggling with when writing currently. You are some kind of magic seriously. Awesome post!